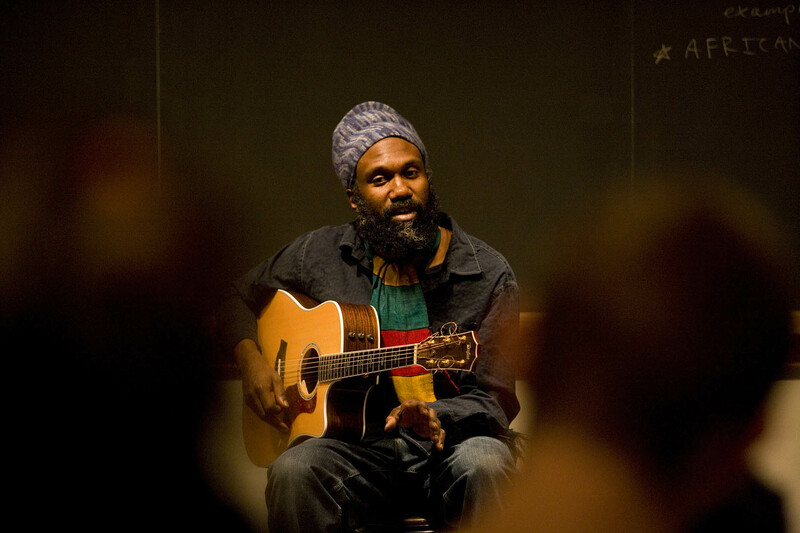 Corey Harris performs in 2008 at Bates College, where he is a member of the class of 1991. Photograph by Phyllis Graber Jensen/Bates College. Corey Harris, a singer-songwriter featured in the Martin Scorsese blues documentary Feel Like Going Home, opens Bates’ brand-new Concerts on the Quad series. Harris will perform in a solo show at 6:30 p.m. on July 18 on Bates’ Historic Quad, at College Street and Campus Avenue. Admission to the series is free, and audience members are encouraged to bring picnics and chairs or blankets. A powerful singer, skilled and inventive songwriter, Harris has carved out his own niche in the blues. A member of the Bates College class of 1991 and the recipient of both a MacArthur Foundation “genius grant” and an honorary Doctor of Music degree from Bates in 2007, he is an intrepid explorer of blues, jazz, reggae and other genres. Learn more. Harris has played venues including the Royal Albert Hall in London, the Lincoln Center in New York and the Kennedy Center in Washington, D.C. He has performed in Africa, South America, the Caribbean, Europe, Japan and New Zealand. In 2003, Harris was at the center of Feel Like Going Home, the debut episode of Scorsese’s PBS documentary series The Blues. For that episode he traveled to Mali to play with Ali Farka Touré, a journey he repeated for his album Mississippi to Mali (Rounder, 2003), which explored connections between African music and the blues. An anthropology major at Bates, Harris studied in West Africa, completing a senior thesis on pidgin English in Cameroon. He won a prestigious Watson Fellowship that supported another visit to Cameroon after graduation. His time in Africa has deeply influenced his work, and his adaptations of African music have won national regard. “This is what we as black Americans gave to the world: the concept of blues,” Harris said in a 2002 interview for Rounder. “But at the same time, I’m of a different generation. I didn’t ever have to go to the back of a bus. Harris released his first album, Between Midnight and Day (Alligator Records) in 1995. His second, Fish Ain’t Bitin’ (Alligator, 1997) won a W.C. Handy Award (now known as the Blues Music Award) for best acoustic blues album. His newest release, 2013’s Fulton Blues (Njumba Records), explores the history of a now-lost black community in Richmond, Va.